No need to try and figure out how to compile and install XFCE 4.10 for Cygwin. There is a Cygwin Plugin Repository where you may install XFCE 4.10 using the Cygwin setup.exe program. Cygwin gives you a Unix-like environment on Windows and it can even allow you to run a GUI like XFCE on Windows. If you have not already installed Cygwin, go to the Cygwin website and download and install it. You don't need to install anything special at this time, just the default packages. After you have installed Cygwin and ran the Cygwin terminal and everything is running ok, you will want to go to the Cygwin Ports website here and it has instructions that allow you to install software with the Cygwin setup.exe program. Just follow the instructions on their page. Caution: When entering user URL for step 4, do not add a trailing forward slash (/) to the URL or you will get errors. When installing XFCE 4.10 from the Cygwin Ports repository, check to install everything that looks like it is important to install to get XFCE up and going. You can always go back and install more XFCE packages later. If you have any problems with libpango1.0_0 post install script failure, you will need to created the directory Cygwin/etc/pango so the script will run. Just go back and run the Cygwin setup.exe as instructed from the Cygwin Ports website and choose to reinstall libpango1.0_0 after creating the directory. If you have no startxfc4 script file in Cygwin/bin, then you didn't install all the required package. Just run Cygwin setup.exe again as instructed by the Cygwin Ports website and install more XFCE packages. Hi, Thanks a lot for this. But I am not getting this to work. can you help somehow please ? It is probably because you are missing something from Cygwin or Cygwin installation is buggy. To be honest, Cygwin is a nightmare and this is not even worth setting up. It is better just to use a Linux distribution with XCFE, either as an optional OS on your system or use a virtualizer to run Linux on Windows. Once you get the XCFE installed, I have no idea how you could even use it with any applications with cygwin. Sorry, what is in my post is all I know about it. Thank you for this page, despite installing any *xfce* packages using the instructions at the ports website, I cannot find any xfce start script or executable in my /bin directory. Do you have any idea how to fix that? You probably missed a package from the cygwin ports website. I am sorry, I do not know which one. It was fun to get it up and going, but it is not very useful. 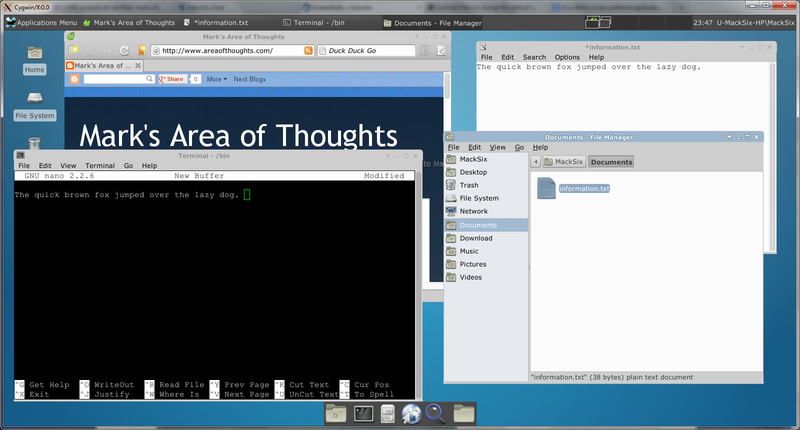 It is better just to use a real Linux distribution with XCFE. I don't even like cygwin. I use MSYS 2 for GNU tools on Windows and MinGW builds for C/C++ tools on Windows. could you post a list of the packages you installed? that would be neato and fitting well in your post about it. I never kept track of the packages. This is actually a waste of time. Use a visual machine and install a Linux distro with XCFE. I came across your page and installed XFCE in cygwin. Superb work and many thanks!